Throughout the 1960s and 1970s, Alsta made beautifully-engineered wristwatches for stylish men and women of intellectual and creative substance. People who required precision and robustness; scientists, engineers and industrialists as well as style-setters and the self-made. It succumbed in the late 1970s, along with many independent watchmakers, to the “quartz crisis”. Hundreds of watch manufacturers went out of business as the world feared the end for mechanical watches. Sadly, before this vision was seen to be unfounded, many respected names, including Alsta, disappeared. Alsta was resurrected in 2014 and after two years in the making, our first wristwatch for over 40 years was released in 2017. 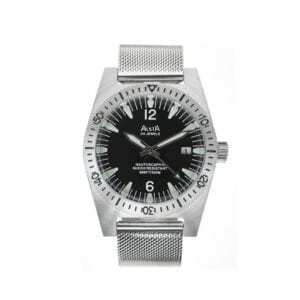 We were inspired by the Nautoscaph dive watch as worn by Richard Dreyfuss as Matt Hooper in the classic movie, Jaws and we chose the Nautoscaph II to revive and lead the resurrection of Alsta in the 21st Century. We are thrilled that the Nautoscaph II has been so well received by Alsta enthusiasts and by new discoverers of the brand. Now, in 2018, we are excited to present to you the next two timepieces from the revived Alsta Watch Company. Firstly, the Nautoscaph III which is a collaboration with our friends at Huckberry. It is similar to the Nautoscaph II except that it is PVD-coated. 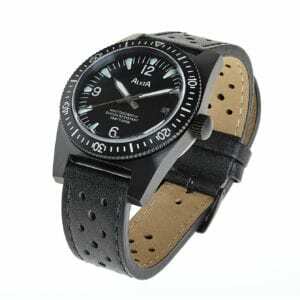 It is presented on a beautiful leather strap. Next, we are proud to present the new Surf n Ski which is inspired by our watch of the same name from the late 1960s/early 1970s. We hope you like them. The new Alsta was created to bring romance back to wristwatches. We don’t simply carbon-copy old models and rely purely on our past. For sure we are inspired by our fabulous portfolio of time pieces from our past however we believe in bringing modern thinking and design touches to our new watches. We are about style and aspiration but not for mere consumption but for conservation, protection and legacy. The typical Alsta wearer is independently-minded, a global citizen, a successful, motivated, lover of adventure and the great outdoors. He will admire explorers of the early 20th century, style icons of the mid-20th century and technology, business and creative pioneers of the modern era. Inspiring those around him, he will be creating his own footprint. Ideals and ideas drive him as opposed to material wealth. Aspiring and inspiring to learn, teach, conserve and protect the truly important things such as our lands and oceans and all that live on and in them is more important than mere consumption. Sure, he may own and enjoy nice things – we all need a little reward for our efforts – but not because these things are expensive; because he admires their style, longevity and craftsmanship. Equally, he may be just beginning to discover and develop his own taste in personal style signifiers, like wristwatches or may simply need robust “tool” watches that will withstand the knocks and bumps of the sea, surf, snow or rock.